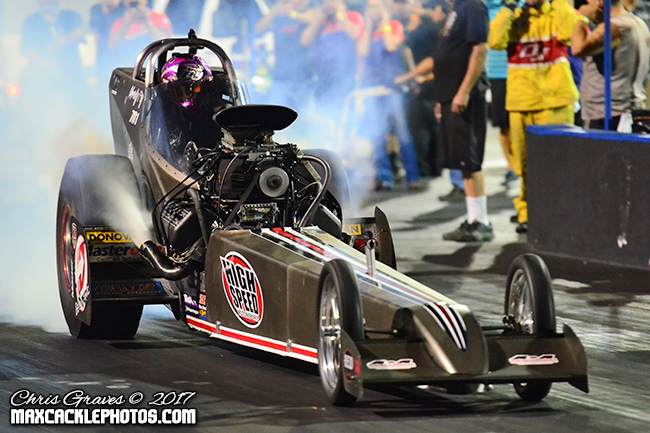 Mendy Fry pushed herself and the High Speed Motorsports AA/Fuel dragster to a victory over Adam Sorokin and the Champion Speed Shop small block Chevrolet special at the Nitro Nationals September 22nd-23rd at Tulsa Raceway Park. Sorokin got the holeshot on the hit, but Fry kept her foot in the High Speed Motorsports fueler and fought off a drift toward the center line with every bit of steering for a 5.62 ET at 258 MPH win over Sorokin’s 5.75 ET at 245 MPH runner-up. “It was all I could to keep it off the centerline, but I didn’t lift,” said Fry. Driver Adam Sorokin said the Champion Speed Shop special pulled strongly almost to the stripe but Fry took the race with a .075-second margin of victory and about 26 feet. Mendy Fry joined driver Tera Graves in the Nitro Nationals Winner’s Circle and marked the first time two women won concurrent Top Fuel and Nostalgia Funny Car wins at a NHRA Hot Rod Heritage Series Championship drag race. Top Fuel got off to a destructive start in Friday testing as Adam Sorokin motored through a front-engine fireball. Sorokin emerged unscathed, but the Chevrolet kicked two connecting rods through the block. 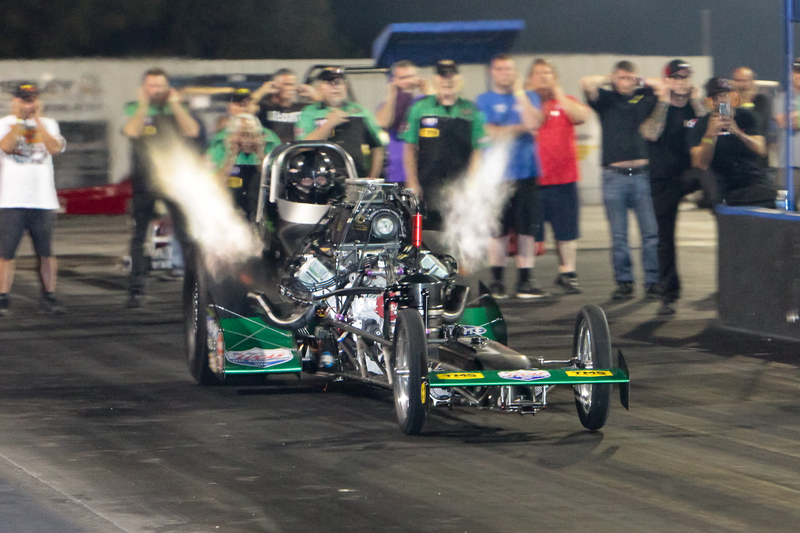 Friday Qualifying under the lights saw more carnage when Jim Young ran the Young Guns dragster to an oil-soaked and subsequently disqualified conclusion while Tim Cullinan skated around the top end to number 4 with a 6.58 at 152 MPH. Julius Hughes pushed the Atlanta Speed Shop dragster to number 5 with a 7.35 ET at 131 MPH. Tyler Hilton lit the candles full track to a 6.17 ET at 232 MPH, and Mendy Fry clicked early in with a 5.87 at 201 MPH for low ET and number one qualifier. Paul Schultz and Dusty Green lost traction for 6th and 7th spots while Jim Murphy pushed back after the burnout with a fuel leak. Saturday Qualifying saw more smoke and fire but not from Adam Sorokin, who posted a clean 5.92 ET at 212 MPH for a number 4 slot after sitting out Session 1 Friday Qualifying. Julius Hughes launched his Atlanta Speed Shop dragster to a smoking but oil free 6.13 ET at 243 MPH and number 5 spot. Tyler Hilton did not improve, but Dusty Green hooked up the Nitro-Hemi with a 6.58 ET and number 7 position. Mendy Fry sat out Saturday qualifying, landing in number 3 after Jim Young and Jim Murphy lit up the boards with a 5.74 ET and 5.87 ET for 1 and 2 qualifiers. Tim Cullinan drove through a top end fireball after a screw plug blowout vented 10000 RPM worth of oily nitro that got the run thrown out. Cullinan made it into the show unharmed with his Friday ET, but Paul “Nobody” Schultz and the Spirit of Tulsa did not. Round 1 Eliminations opened with Jim Young trailering Tim Cullinan with a 5.81 ET at 239 MPH in a penalty box Top Fuel matchup. Mendy Fry drove her hemi-powered fueler to a 5.73 ET at 232 MPH win over Tyler Hilton and his big block Chevrolet-powered Great Expectations III dragster. Dusty Green had the reaction time advantage in the Nitro-Hemi, but Jim Murphy and the WW2 prevailed with a 5.72 ET at 245 MPH and .031-second margin of victory over Green’s 5.80 ET at 247 MPH. Sorokin charged hard out of the gate ahead of Julius Hughes and clicked it early with a 5.81 ET at 219 MPH win in a small block Chevrolet vs. big block Chevrolet Top Fuel battle. Semi-Final Eliminations saw Adam Sorokin turn an impossibly quick .004 reaction time against Jim Young into a win for the Champion Speed Shop with a mere .023-second margin of victory that had the crowd scratching its head after Sorokin lit up the win light with a 5.70 ET at 234 MPH over Young’s 5.68 ET at 260 MPH. 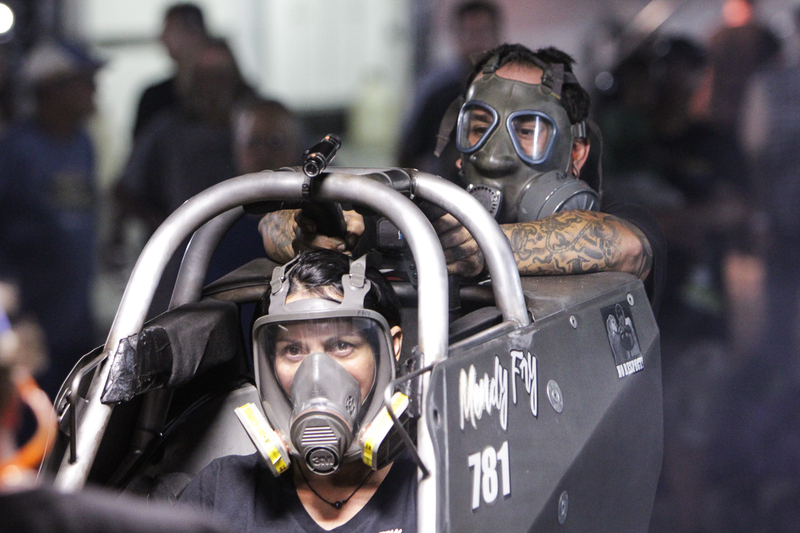 After going out with a red bulb against Murphy at the Nightfire Nationals, Mendy Fry dispatched the veteran hot shoe with a redemptive 5.68 ET at 259 MPH that set the stage for the final round Top Fuel fight as the WW2 dragster sent sparklers up out of the headers in protest with a 5.89 ET at 211 MPH. The Champion Speed Shop team delivered the special back into the lanes in a Herculean effort considering the parts carnage that marked the beginning of their weekend. High-Speed Motorsports got their hemi together for the second Chevrolet vs. hemi Top Fuel final in as many races. Those who stuck around as night worked towards morning were duly rewarded with a close race and dramatic conclusion to the two-day event that witnessed drag racing the way it was moving into the future with next-generation fans and tomorrow’s racers smiling as Mendy Fry lowered them into the cockpit of her Top Fuel dragster in the Winner’s Circle for photos and a lifetime of memories. The next and last stop in the 5-Race 2017 NHRA Hot Rod Heritage Racing Series is the California Hot Rod Reunion at Auto Club Famoso Raceway in Bakersfield, California. Adam Sorokin and Jim Murphy will run the postponed Nightfire Nationals Top Fuel final round. The assembled AAFD drivers and teams will then battle one last time for the 2017 Top Fuel Championship. Head over the NHRA Museum or Auto Club Famoso Raceway for more information and tickets to the premier vintage drag racing event on the west coast until the March Meet in 2018. Like and follow the All American Fuel Dragsters on Facebook for an ongoing chronicle of NHRA Hot Rod Heritage Series Top Fuel drag racing and more including event coverage, photos, results, and video highlights from upcoming episodes of the Dragstrip Rumble AA/Fuel Top Fuel Dragster video series. Like and follow the Dragstrip Rumble on Facebook and subscribe on YouTube for instant episode updates and front-engine Top Fuel drag racing action free of charge. The All American Fuel Dragster coalition is bringing a full field of front-engine Top Fuel dragsters to the Nitro Nationals at Tulsa Raceway Park for their next to last battle in the 5-race NHRA Hot Rod Heritage Championship. This volatile nitro-fueled mix of qualifying and 8-car eliminations carries on a Tulsa Top Fuel dragster competition tradition set in motion at the NHRA World Finals from 1965 to 1968 and into the Seventies with the PRA National Challenge when the storied drag strip was known as Southwest Raceway. Current Top Fuel points leader Jim Murphy and the WW2 Racing Team juggernaut are set to reprise nitro-burning action at Tulsa Raceway Park after unexpected rain at the Nightfire Nationals in Boise pushed the final round between Murphy and Adam Sorokin out to the California Hot Rod Reunion. Adam Sorokin feels the Champion Speed Shop small block Chevrolet combination is on track against the Roland Leong-tuned WW2 hemi and anyone else. “I was clicking it early all through the Boise race. We only scuffed two pistons. I think the car is going to really start running”. Driver Mendy Fry will be living on Tulsa time from the number two points position in the High-Speed Motorsports hemi-powered Top Fuel contender and Dusty Green will meet the Nitro-Hemi in T-Town for a run at the stripe from the number four slot. Jim Young and the Young Guns are rolling their hemi-powered front engine AA/fueler towards the Oil Capital of the World from Wisconsin and Tyler Hilton is moving towards Tulsa Town after footing his big block Chevrolet-powered Great Expectations III AA/Fuel dragster to a 5.89 ET at 247 MPH against Paul Romine’s Funny Car at US 131 Motorsports Park in Michigan. 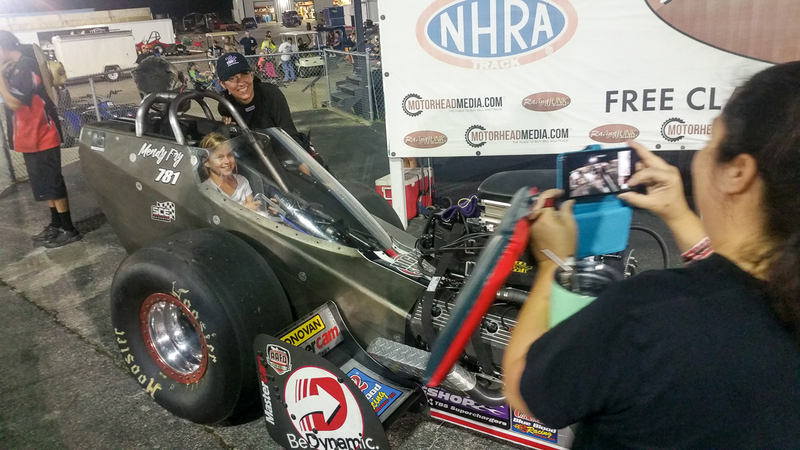 Local favorite Paul “Nobody” Schultz is in good spirits and suiting up to run the hemi-powered Spirit of Tulsa AA/Fuel dragster for a Nitro Nationals top spot. Tim Cullinan and his Nitro Nostalgia entry are on the way from Illinois, and the oldest speed shop in the southeast will be represented by Julius Hughes and his Atlanta Speed Shop AA/Fueler. Last minute entries into the fray are as yet unknown. Reigning Top Fuel Champion Tony Bartone is on the injured list with the California Hot Rod Reunion in Bakersfield in sight as a recovery plan. As more nitro is good nitro the All American Fuel Dragsters will join front-engine blown alcohol and injected nitro A/Fuel dragsters, fuel-huffing supercharged nostalgia Funny Cars and front engine Junior Fuel dragsters along with a collection of nostalgia high-axle Gassers and pre-1972 doorslammers that may or may not have a tiger in the tank. But wait, there’s more! The Nitro Nationals will also feature a car show, live bands, and a pinup contest held in conjunction with racing action. The 2017 Nitro Nationals runs Friday and Saturday, September 22nd and 23rd. Gates open Friday at 10 AM for racers and vendors. Spectator gates open at 5 PM. Racing commences at 6 PM. Gates open Saturday at 9 AM. Racing starts at 2 PM. Top Fuel and A/Fuel dragster, Funny Car and Junior Fuel begin qualifying under the lights Friday at 8 PM and resume Saturday 2 PM. Eliminations Saturday the 23rd at 6 PM, 8 PM, and 10 PM. Schedule subject to change. Find an event flyer and schedule here. Top Fuel points standings heading into the Nitro Nationals at Tulsa Raceway Park and fourth event in the 5-race NHRA Hot Rod Heritage Series. Boise final round Top Fuel points to be settled at the California Hot Rod Reunion and last stop for the All American Fuel Dragster coalition this year at Famoso Raceway in Bakersfield, California October 20th-22nd. Head on over to http://www.nhrahotrodheritage.com for a schedule, racing news, points standings, tickets, race results, rules and more.